Moving an upright or a great piano is hard and responsible work. Just one mistake of a mover can once and for all deprive your piano of a decent sound and turn it into a piece of useless junk. It is really a difficult task to move carefully a big and heavy piano (that may weigh up to 350 kg) out of a narrow city apartment. Regular movers are not skilled enough to move a piano, which often results in damaging it while moving: the frame either cracks or goes askew, the acoustics gets irretrievably spoilt, and various parts of the carcass get torn off. To avoid this scenario, the instrument should only be carried in long straps fastened underneath it. 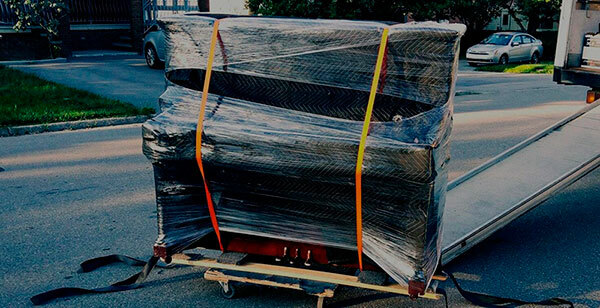 Trustmove company offers piano moving services in Montreal. Our team will help you move your piano carefully. To make sure the moving is safe and fast, the piano should be prepared beforehand. A properly packed piano carcass ensures the instrument's intactness and guarantees the striking mechanism remains in good order (quilts are often used for extra safety). We guarantee the safety of your piano while it is being moved. Our piano movers have all the necessary equipment for performing rigging operations (straps, fasteners, clips, ropes, etc.). Our trucks make it possible to fasten the piano to the wall while being transported, which excludes the possibility of any damage being done to both the carcass and the internals. Thanks to this, you will not have to call for a piano tuner straight away - your instrument will sound just as it did before the moving. Great quality of work. Fast and cheap, nice workers.